Thinking of party games for teens can be difficult. You want to think of something that is fun & silly but not too childish. I’m a huge fan of scavenger hunt games and there are so many great ways you can plan a teenage scavenger hunt. For a party, the teens can be broken into teams of 3-4 and assigned one adult and one vehicle per team. The adults can be the drivers while the teens are taken to different locations in order to uncover the clues around the city. They don’t actually have to pick up items around the city, just take a picture of themselves in the location to prove that they solved all of the clues on your scavenger hunt list. I didn’t make this game into a free printable because every city and town is so different. What I have done is put together a list of places that you could include in your teenage scavenger hunt depending on what your city has to offer. You will have to do a little research of your own to see what area of interest you’d like the teams to find in each location. Be specific – like a specific sign to find, a specific flag, a specific advertisement, etc. Make sure that each team has a camera so they can take a picture of themselves in each of the locations. After teams have found each location and taken a picture, they could meet back at the party area for food, drinks and to share stories and photos. 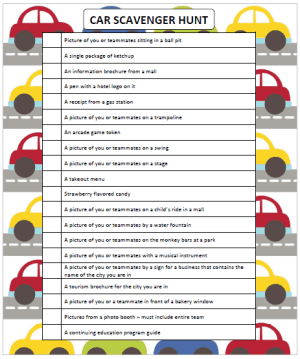 For free printable teen scavenger hunt games – check out these Car Scavenger Hunt & Mall Scavenger Hunt games. Looking for more teenage scavenger hunt ideas? Check out our Free Printable Game page for loads of fun games! 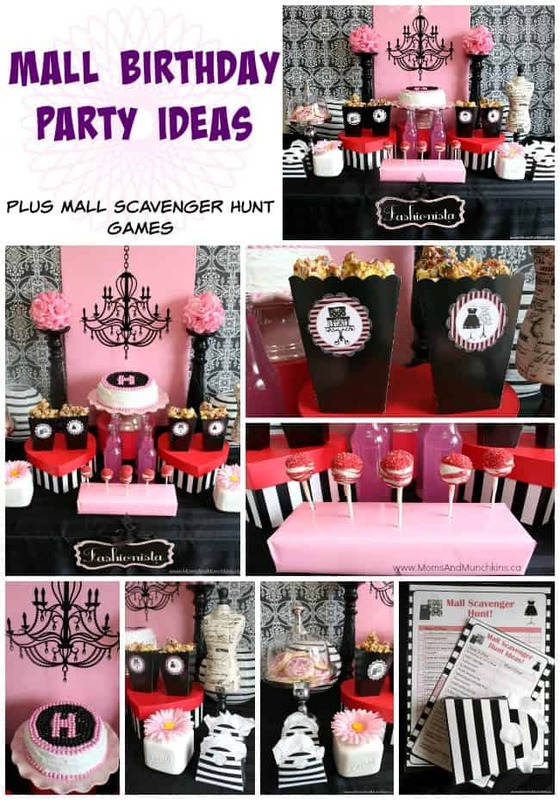 Planning a scavenger hunt party at a mall? 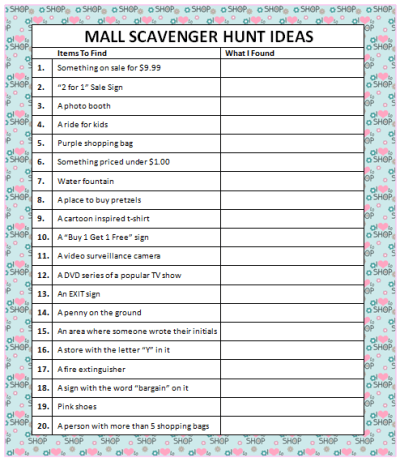 Check out our fun Mall Scavenger Hunt Party ideas! We’re always adding new ideas! Stay updated on the latest by following along on Facebook, Twitter, Pinterest and Bloglovin’. Love this idea! It’s so engaging and can be a lot of fun. You can do something similar with younger kids too, but keep an adult with them and have them “scavenge” in a safe area. Love these. Taking a road trip tomorrow that is very long and I stumbled onto these on your site so thanks so much! Thank you, Paula! I hope you have a great trip!